It was the fifth Breeders’ Cup victory for Juddmonte and first in the Classic. The victory gave Baffert a third consecutive triumph in the Classic, an unprecedented achievement at the World Championships. Now a winner of 14 Breeders’ Cup races, Baffert won the 2014 Classic with Bayern and last year’s running with Triple Crown winner American Pharoah. Smith, who won three races this weekend to boost his World Championships total to a record 25, won the Classic for the fourth time. Smith’s other Classic wins came on Skip Away in 1997, Zenyatta in 2009 and Drosselmeyer in 2011. California Chrome, ridden by Victor Espinoza, took the lead out of the gate and raced on an unchallenged lead through fractions of 23 1/5, 47 and 1:10 4/5. Smith had Arrogate in the clear outside of horses on the run down the backside and began moving at the leaders on the far turn. On the turn, Arrogate cut to the inside of Melatonin, who had been tracking California Chrome, and then shifted to the outside to take dead aim at California Chrome. California Chrome still maintained a daylight advantage in the upper stretch, but Arrogate closed steadily to pull away late. 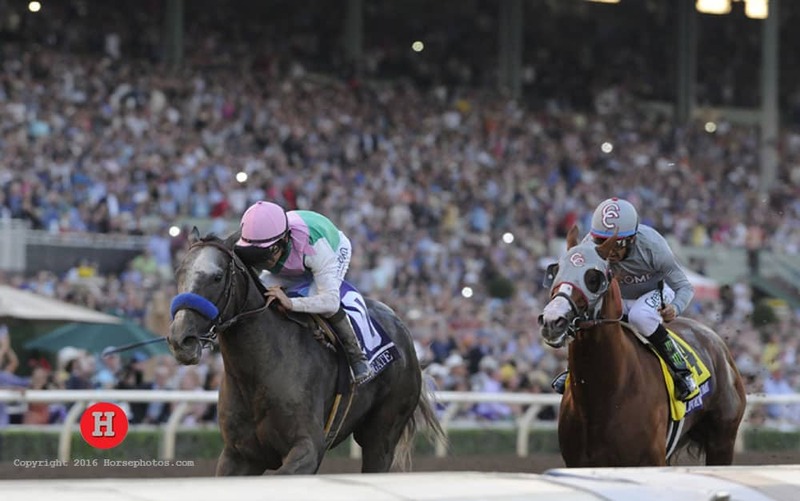 A crowd of 72,811, the highest single-day attendance for a Breeders’ Cup since the event switched to a two-day format, cheered on as blossoming 3-year-old star, Juddmonte Farms’ Arrogate, bested hometown favorite California Chrome, North America’s richest racehorse, at the wire to win the $6 million Breeders’ Cup Classic today at Santa Anita Park. Saturday’s attendance at Santa Anita was the highest for any Breeders’ Cup day since 72,730 were on hand at Churchill Downs in 2010 to see legendary race mare Zenyatta in the final race of her career. The two-day attendance for 2016 was 118,484, the highest in Breeders’ Cup history. Common-pool wagering on Saturday’s 12-race Breeders’ Cup card was $109,055,897, a 3.2% increase over the $105,625,491 wagered in 2015. Common-pool wagering for the two days was $159,991,803 an increase of 6.25% over the $150,574,656 total in 2015. Saturday’s on-track handle was $13,515,269, an increase of 3.5% over last year’s on-track handle at Keeneland. The on-track handle at Santa Anita for the two days was $20,694,235. For full results and recaps from all 13 Breeders’ Cup stakes, visit the Results page of the Breeders’ Cup website here and select a race from the menu on the left.